UPDATES ONLY Thread for the launch of NROL-76 mission. Successful launch on May 1, 2017 at 7:15am EDT (1115 UTC). First stage, core 1032, landed at LZ-1. Per L2, Static Fire NET is April 12. Pending 39A shakedown report on pad status/repairs required (been holding up great so far). 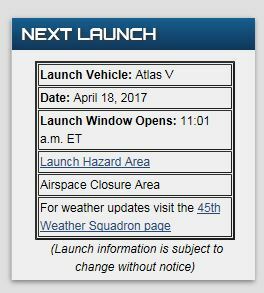 Launch date NET is April 16 with the window opening at 7am local, for around two hours. Yep, we've been waiting for the new date to become documented and now it is via L2 KSC/Cape scheduling. NET April 30, same window. Static Fire on April 26. No reasons given, so likely the payload (which isn't talkative as we're talking about a NROL bird). Looks like we have rollback into the HIF for the Strongback and Launch Table, per Instagram. Good progress given 1 1/2 weeks to Static Fire. of North America; therefore, the target orbit is a quasi-60 degree LEO, or a Molniya. payload is either headed for LEO, or is a fairly low in mass and headed for Molniya. failed upon reaching its 58.5 deg, 360 km orbit. If Molniya, then I suspect it is a new generation of SDS Molniya, built on Boeing's BSS-702SP bus. Molniya SDS seems more likely. Static Fire is NET Tuesday. Article for the Static Fire (and FH testing). Some are bound for happiness, some are bound to glory, some are bound to live with less, who can tell your story? Test window is now open, for six hours. No sign of venting yet, so may be a while off....but it's rare they fire up as the window opens during a Static Fire test. For those staring at the webcast and scanning for venting, L2's latest is a T-0 of 3pm local (7pm UTC), meaning prop load should be soon. They aren't understood to be working issues, just behind on the timeline. Venting can be seen by the RSS. 9 minutes away from 3pm. One more big vent from S2 location. Next: Quick look data review. SpaceX usually tweet if that looked good. "Static fire test complete. Targeting Falcon 9 launch of NROL-76 on Sunday, April 30."